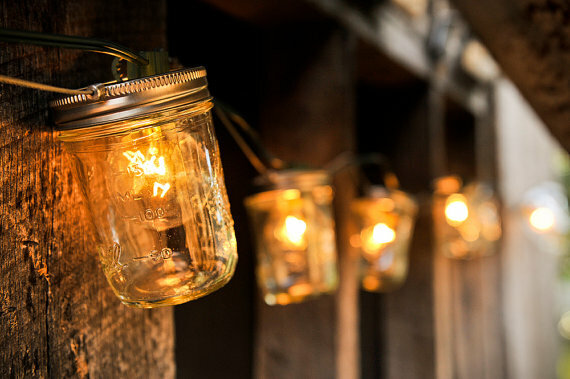 Here you'll find several Outdoor Mason Jar Lights projects to brighten and add a stylish look to your yard or home patio. Mason jars of all sizes have skyrocketed in popularity along with burlap and pallets as DIY and upcycle project materials. 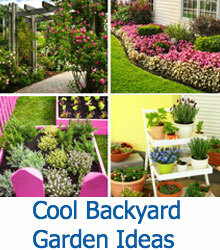 They give your space a sweet, homey, quirky atmosphere, both indoors and outdoors. Mason jars are, actually, incredibly versatile as a crafting base. Of course, they’re perfect for their original intended purpose: as containers for jellies, jams, and other preserves, but they’re also excellent and relatively sturdy housing for more fragile lightbulbs. Outdoor lighting can be prohibitively expensive, and if you are on a budget, you probably don’t want to spend the money on lighting your backyard or patio, even if you plan on spending a great deal of time outside at night. The glow of these illuminary projects are sure to add an incredible soft, romantic atmosphere to any patio or backyard, large or small, whether you string them along a rustic wooden fence or hang them like a chandelier under a covered patio. This collection features a number of unique projects that range from more complex projects to simple projects you can do with older children. 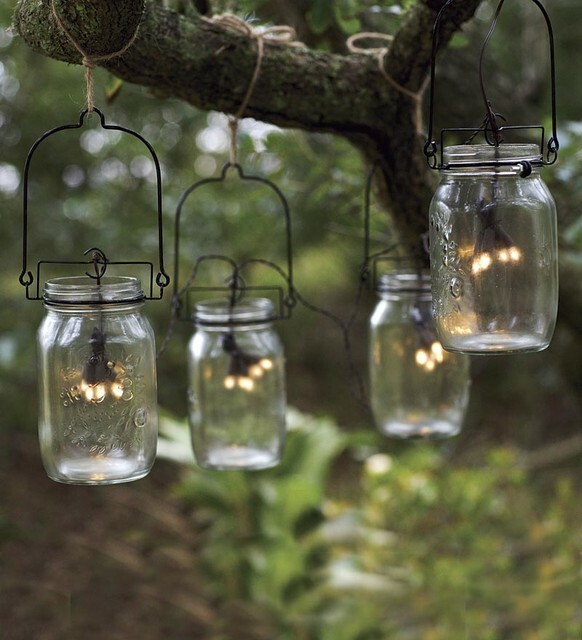 We’re sure you’ll find something incredible to illuminate your backyard! Thick, sturdy chains attach these simple jars to the top of a fence or other vertical surface. The tops of these lights are open, as not to smother the candle’s flame. Small pebbles keep the candles snugly in place. 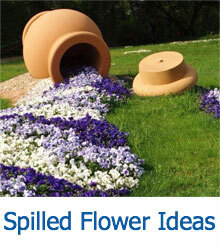 You can easily place a cover on these to protect them from the rain. This incredibly simple lantern is perfect to sit on a patio table. A small hole in the top lets the candle inside breathe, and the exterior is covered with colored glass marbles that create a gorgeous shadow. 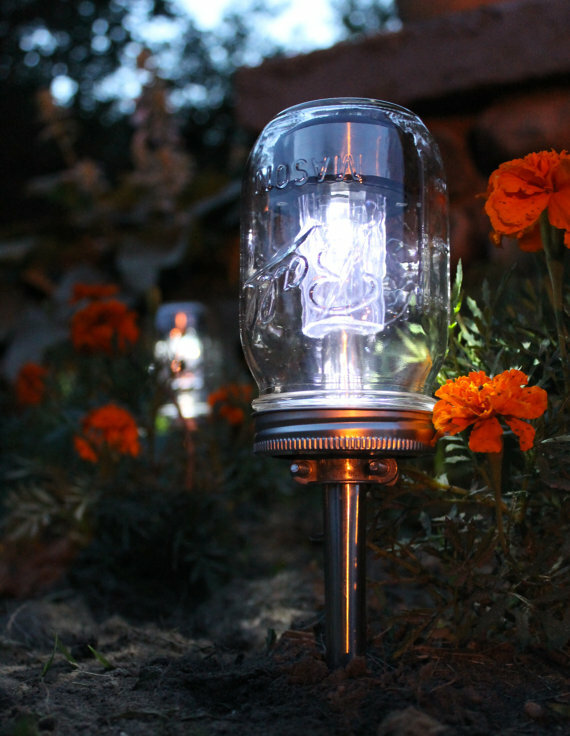 A simple wire handle allows this lantern to be moved easily while lit. 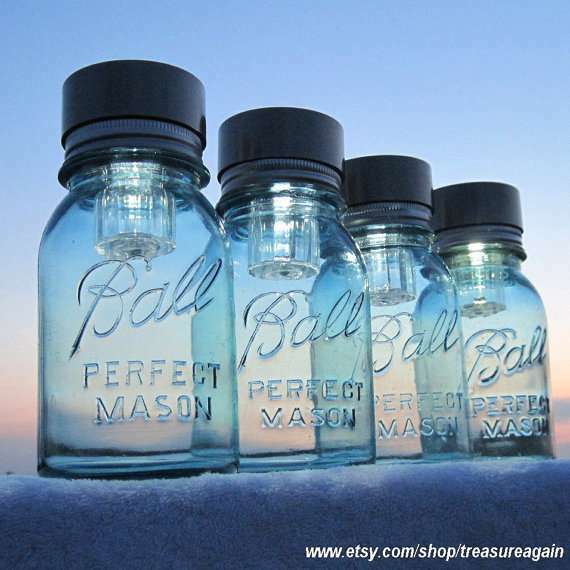 The thicker, sturdier mason jars protect these thin, delicate lightbulbs from any wind or weather. Strung along a fence, or even along the edge of a covered patio, these provide a soft yellow light that isn’t too glaring for a nighttime gathering. 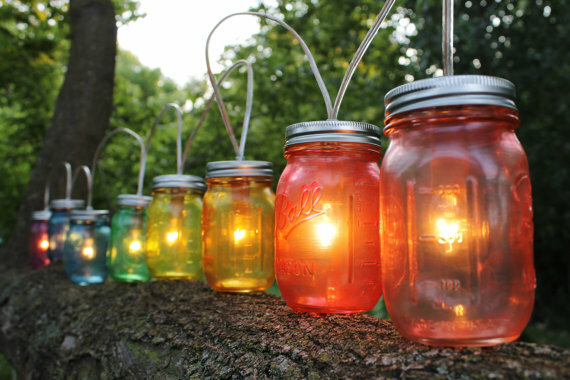 A simple colored glaze can transform a string of ball jar lights into an adorable rainbow. 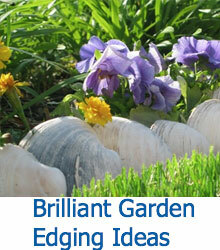 These can be strung along a fence, or simply placed along a railing or branch, as shown above. 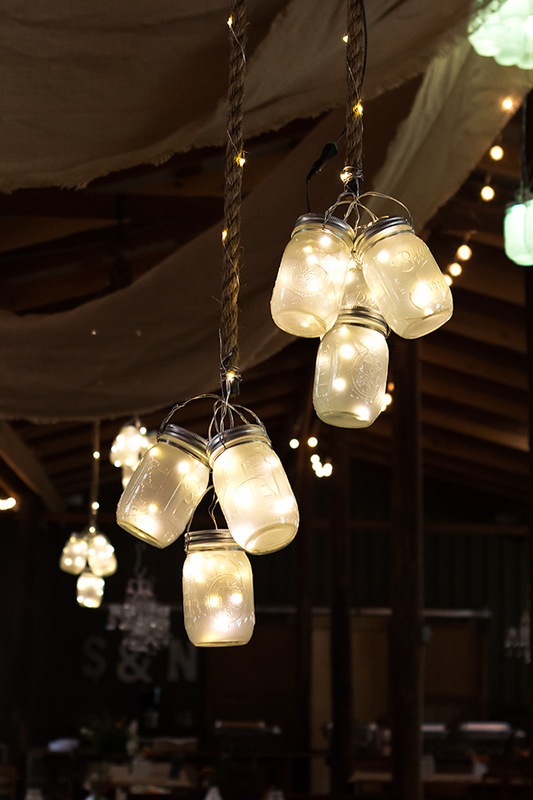 By replacing the typical top of a mason jar with a screw on solar light cap, you can easily make environmentally friendly solar lanterns with a bit of rustic chic flair. Twine is what fastens these simple lights to the tree branch. Small clusters of outdoor icicle lights create the soft luminary effect. 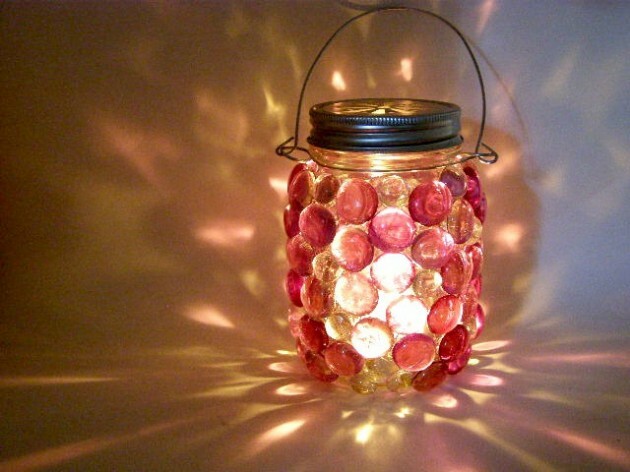 This fun project is perfect for late night parties or bonfires. 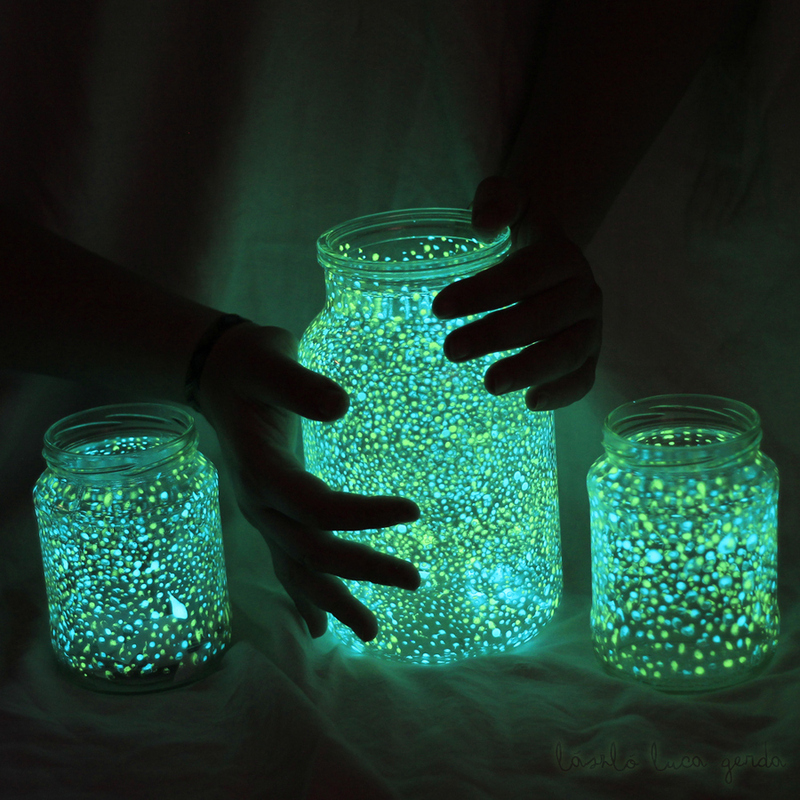 The otherworldly neon glow of these simple jars sets them apart from any other mason jar light. Groups of LED lights are contained within frosted mason jars, which cut down on any harsh glare and create a firefly effect within the jar. Three or more jars are fastened to thick ropes and attached to the top of a covered patio. 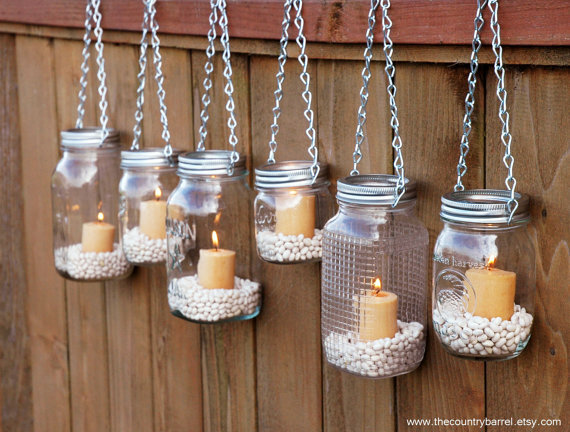 These cute mason jar stake lights are easy to make and are the perfect addition to any garden pathway. Plus, they’re solar lights, so you don’t have to worry about changing batteries or bulbs. Traditional tiki-torches are large and can be difficult to fit into your decor unless, of course, your decor is beachy or tropical. 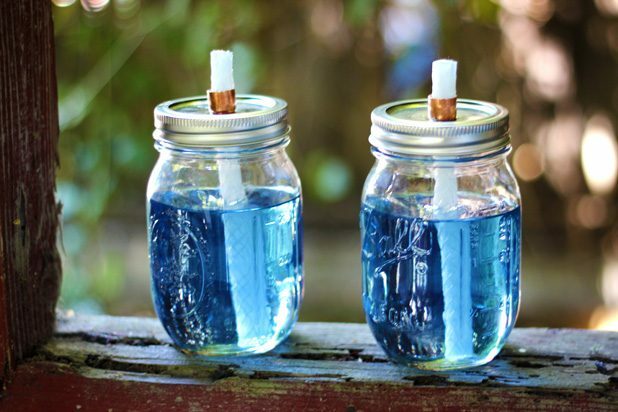 These smaller, cute mason jar citronella candles will keep bugs away just as well, and can easily be positioned wherever you need.